A common tree in the woodlands around campus, it is easily recognised by the smooth, grey to white trunk and the broadly ovate to almost orbicular leaves. 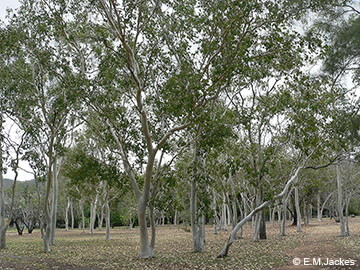 In the late dry season water stressed trees will lose almost all their leaves, while those with access to water will drop their old leaves about the same time as the new ones appear. Flowers are white in clusters, November – December, and the capsules have 3-4 valves exserted.